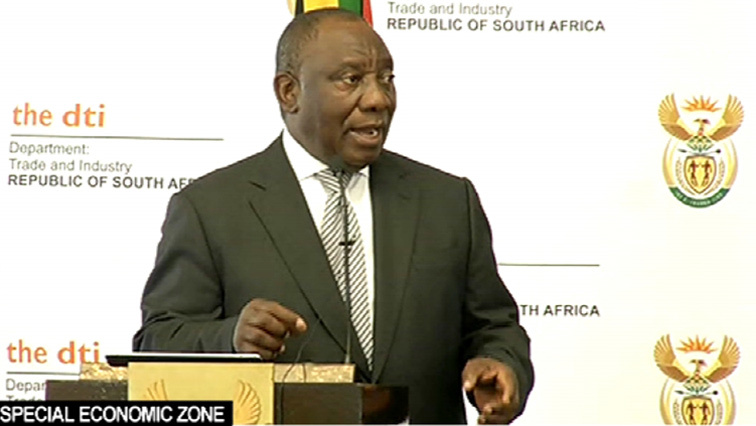 Zones can help launch economic recovery says Ramaphosa - SABC News - Breaking news, special reports, world, business, sport coverage of all South African current events. Africa's news leader. President Cyril Ramaphosa has launched the Special Economic Zones in Atlantis. President Cyril Ramaphosa says Special Economic Zones (SEZ) can work as launching pads for much-needed economic recovery in the country. Ramaphosa says government wants to use these zones to attract direct foreign investment into the areas where they are situated. He was speaking at the launch of the Atlantis Special Economic Zone on the West Coast. He has urged the people of Atlantis to look at this as a great opportunity. Ramaphosa says government sees Special Economic Zones as integral to efforts to re-ignite economic growth and job creation. He says countries like China have used these successfully to propel towns that were totally under-developed in to thriving metropolis. Atlantis is an economically depressed area. Over the years, government has taken measures to attract investment in the area. It has therefore become a major hub for especially electronic manufacturing. Government is hoping to attract even more investment to the area through the declaration of the Special Economic Zone. Ramaphosa says this SEZ is a great opportunity that the people of Atlantis should embrace. Western Cape Premier Helen Zille says if government is serious about attracting investment, it must do something about the red tape as it makes it difficult to invest. The president says this is exactly what government is committed to doing. He says so far the SEZ’s have attracted R11 billion in investment. He has added, however, that he expects it to grow. This entry was posted on 06 Dec 2018,05:47PM at 5:47 PM and is filed under Business. You can follow any responses to this entry through the RSS 2.0 feed. Both comments and pings are currently closed.